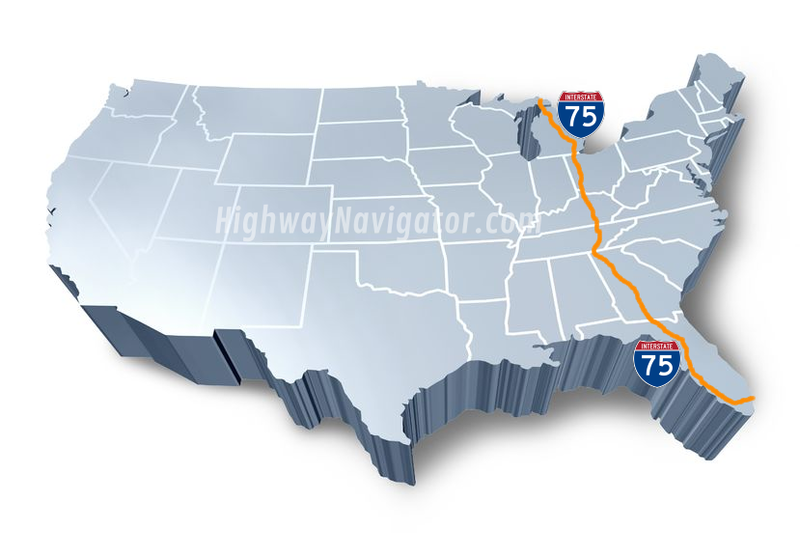 Interstate 75 is a major Interstate Highway in the Great Lakes and Southeastern regions of the United States. As with most Interstates that end in a five, it is a major cross-country, north–south route, one of the longest in the U.South., from southern Florida to the northern tip of Michigan. It travels from State Road 826 (Palmetto Expressway) and SR 924 (Gratigny Parkway) on the Hialeah–Miami Lakes border (northwest of Miami, Florida) to Sault Ste. Marie, Michigan, at the Canadian border. I-75 is the seventh longest Interstate Highway, the second longest north-south after I-95, and passes through six different states: Florida, Georgia, Tennessee, Kentucky, Ohio, and Michigan. The major metropolitan areas that I-75 connects to includes (from south to north) Miami, Tampa, Atlanta, Cincinnati, and Detroit.